In contrast to all other cranial nerves, the optic nerve actually is a white matter tract of the central nervous system (CNS) that extends into the orbit where it is surrounded by cerebrospinal fluid (CSF) flowing through the subarachnoid space (SAS) in very much the same manner as the brain is suspended in CSF in the intra-cranial space (Figure). Because it extends out of the cranium, the optic nerve thus offers a unique window to investigate CSF homeostasis and its role in neuropathies. Aim: To characterize the role played by meningothelial cells lining the subarachnoid space in the maintenance of cerebrospinal fluid homeostasis. Cerebrospinal fluid (CSF) surrounding the central nervous system acts as both a mechanical protection medium, and a steadily flowing metabolite collector and neuroendocrine communication pathway. In addition to convective or diffusive molecular transport, its composition is actively controlled by meningothelial cells (MECs) lining the subarachnoid space (SAS), via the production of cytokines and proteins and the endocytosis of macro-molecules and apoptotic cells. Exposing MECs to elevated pressure induces cell proliferation and a dramatic decrease in endocytotic activity . These changes can be expected to directly impact SAS geometry, CSF composition and flow, all of which may in turn influence neuronal function. Based on their similarity to vascular endothelial cells, MECs might also be expected to respond to the shear forces imposed by the CSF flow or actively participate to waste clearance via trans-cellular transport. In this study we will investigate the impact of different flow conditions on MECs cell response using our in house flow reactors. Aim: To understand cerebrospinal fluid (CSF) dynamics along the optic nerve, and potential relationships between CSF dynamics, MECs response in optic neuropathies such as normal tension glaucoma. One challenge in linking biological results obtained in cell cultures to in vivo manifestations is the difficulty to characterize the local CSF pressures and velocities in vivo, due to the small dimensions of the SAS and trabecular structures. Numerical simulation could provide a mean to circumvent such difficulties, characterizing the CSF dynamics to a level of details not achievable in vivo. 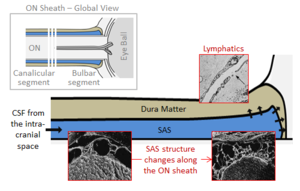 In this study, we will thus develop a multiscale model of the CSF dynamics along the optic nerve accounting for the significant regional variations in SAS dimensions and trabecular microstructure noted along the length of the ON sheath  (Figure). Ultimately, these simulations may incorporate the experimental results to try and explain pathological observations.